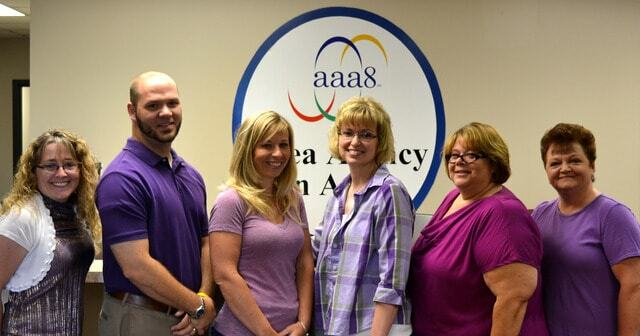 AAA8 Staff wearing purple for Elder Abuse Awareness. OHIO VALLEY — The Area Agency on Aging 8 and other community organizations are working to raise awareness of an emerging problem this June, the problem of elder abuse. Recognizing the significance of elder abuse as a public health and human rights issue promotes a better understanding of the many cultural, social, economic and demographic processes affecting elder abuse and neglect. Huff added that to ensure safety for Ohio seniors, their protection must be a top priority. Implementing changes to the state adult protective services law recommended by the ODJFS APS Funding Work group and providing sufficient resources to ensure that robust and responsive adult protective services are available in every county for seniors in need is among the ways to ensure senior safety. Elder abuse, neglect and financial exploitation of the elderly are growing problems. For the first time in history, people age 65 and older now outnumber children under age five. Each day, more than 10,000 Americans turn 65. This trend will continue for the next 20 years. At the same time that the population is growing, we know a large number of older adults face abusive conditions. Every year an estimated 5 million, or one in 10, older Americans are victims of elder abuse, neglect, or exploitation. In Ohio, more than 15,000 incidents are reported statewide each year. Policy Matters of Ohio estimates the actual number of incidents is between 75,000 and 214,000 each year. Anyone can be a victim of elder abuse. It is important to know the signs and how to report suspected cases. Bruises, pressure marks, broken bones, abrasions, and burns may be an indication of physical abuse, neglect, or mistreatment. Unexplained withdrawal from normal activities, a sudden change in alertness and unusual depression may be indicators of emotional abuse. Behavior such as belittling, threats, and other uses of power and control by caregivers or family members are indicators of verbal or emotional abuse. Strained or tense relationships, frequent arguments between the caregiver and elderly person are also signs. Bedsores, unattended medical needs, poor hygiene and unusual weight loss are indicators of possible neglect. Sexual abuse is often difficult to spot, but there are indicators such as bruising around breasts and genital areas. Some behaviors associated with self-neglect are hoarding to the extent that the safety of the individual is threatened or compromised, failure to provide adequate food and nutrition for oneself or refusal to take essential medications or seek medical treatment for serious illness. Sudden changes in financial situations may be the result of exploitation. Loss of resources may be the result of emotional manipulation or schemes to take advantage of older persons vulnerabilities. Financial exploitation may lead to other forms of abuse; a loss of resources may put the individual in a position of being unable to afford food, medicines or assistance needed in activities of daily living. Embarrassment at being taken advantage of may lead to depression and withdrawal. If you have reasonable cause to suspect elder abuse, contact your county Adult Protective Service office 24 hours a day, seven days a week. Other agencies to report abuse include Ohio Elder Abuse hot line at 866-635-3748 or 1-800-677-1116. If you suspect elder abuse or neglect in a nursing home, call the Nursing Home Abuse/Long Term Care hot line at 1-800-342-0533. Raising awareness of elder abuse and neglect is a challenge and no effort is too small. For resources for caring for elders, visit www.areaagency8.org or call 1-800-331-2644.